Green Left Weekly will be liveblogging the Bust the Budget rallies today. We'll being updating this blog with news, photos and video from rallies all over the country throughout the day. Updated 4.20pm. Over on the west coast, the Bust the Budget rally in Perth has begun after having to change location due to bad weather. 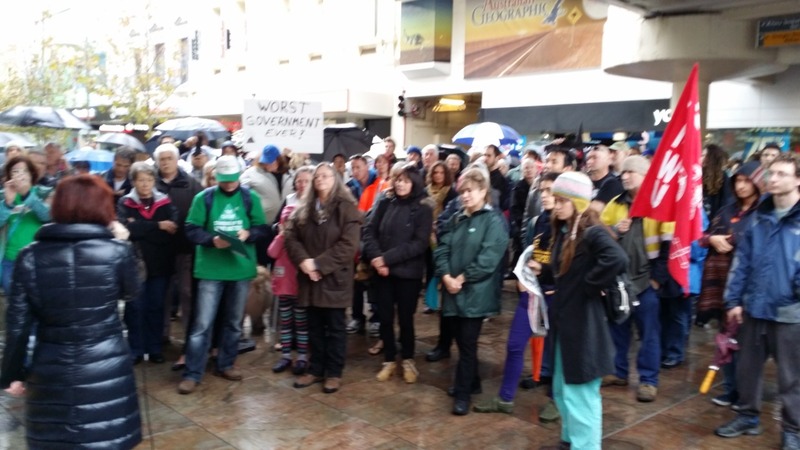 Hundreds have braved the rain to hear from speakers in the Murray Street mall. When Treasurer Joe Hockey addressed the Sydney Institute on June 11, he complained that it is not fair that more than $6000 a head will be spent by the government on welfare this year. He said this means "the average working Australian, be they a cleaner, a plumber or a teacher, is working over one month full time each year just to pay for the welfare of another Australian." Under intense lobbying by big electricity companies, the Tony Abbott government is attempting to scrap the Renewable Energy Target (RET) which aims to have 20% of Australia’s electricity come from renewable energy sources by 2020. In response to this threat, a new community group called Solar Citizens is campaigning to defend existing solar power and extend solar to even more households. They have held public meetings in Brisbane, Adelaide, Sydney and Melbourne. “Thank you for these protest. We love you and our hearts are with you in this moment,” a refugee in Yongah Hill detention centre told a member of the Refugee Rights Action Network (RRAN). About 7000 people rallied in Melbourne for World Refugee Day on June 22. The rally called for detention centres on Manus Island and Nauru to be closed; for fair processing of asylum seekers; and for justice for Reza Berati, who was murdered in detention on Manus Island. The rally included contingents from regional areas such as Geelong and Ballarat. Reverend Alistair McRae from the Uniting Church said: "Policies of deprivation and punishment have taken the place of our legal and moral obligations of care. It's not OK. Shame on the government and the previous government." About 250 Aboriginal people and their supporters gathered in solidarity at the steps of South Australia’s Parliament House on June 17 to protest against the proposed federal budget. Included in the budget is $534 million in cuts to Aboriginal programs around the country. The rally was organised by Narungga elder Tauto Sansbury. It has been seven years since the federal government introduced the Northern Territory intervention. To mark the date, a protest was held outside Alice Springs courthouse on June 21, demanding an end to the intervention, now known as Stronger Futures, and an end to income management. Labor stood by its "longstanding principles" along with the Greens and refused to block the first of the supply bills in both the House of Representatives and the Senate last week. Only Andrew Wilkie and Clive Palmer voted against these bills in the House of Representatives. There were no votes against the bills in the Senate. Environment Tasmania and the Bob Brown Foundation released this statement on June 24. World heritage experts and conservationists have welcomed the decision of the World Heritage Committee to reject the Australian government’s attempt to delist 74,000 hectares of forests from the Tasmanian Wilderness World Heritage area. Nine days before the Senate changeover, the High Court ruled that immigration minister Scott Morrison’s cap on the number of protection visas he could grant was invalid. In March, using his arbitrary ministerial powers, Morrison limited the maximum number of protection visas to be granted in the financial year to 2773 — the exact number already given. This was in response to Labor and the Greens uniting in the Senate to block the reintroduction of temporary protection visas (TPVs). The Media, Entertainment and Arts Alliance released this statement on June 23. The Media, Entertainment & Arts Alliance (MEAA), the union and professional association for Australia’s journalists, condemns the verdict of the Cairo court in the case involving journalists from Al Jazeera English and calls on Egyptian authorities to urgently intervene to free the three journalists who have been detained for simply doing their jobs. The statement below was released by the Independent and Peaceful Australia Network (IPAN), supported the Sydney Stop the War Coalition, on June 26. Anti-war and peace groups from across the nation are uniting to urge the Australian government not to involve itself in any further military action in Iraq. The groups insist that Australia should resist any pressure it might be under to follow the US’s lead – in the way that it did in 2003. Australian resident Natalie Lowrey remains in detention in Malaysia after her arrest at a peaceful protest demanding an Australian company to close down its operation of the Lynas Advanced Material Plant (LAMP) in Kuantan. Lowrey was arrested at the peaceful protest on June 22 along with 15 Malaysian citizens — the locals have all been released, yet Lowrey remains detained. Colleague and Rare Earth campaigner Tully McIntyre is in Malaysia, has visited Natalie and has expressed concern for her wellbeing. Official statistics from the Palestinian Authority's Ministry of Information have revealed that 1518 Palestinian children were killed by Israel's occupation forces from the outbreak of the second intifada ("uprising") in September 2000 up to April last year. That's the equivalent of one Palestinian child killed by Israel every three days for almost 13 years. A spectre is haunting Venezuela ― the spectre of the colectivos. All the powers of old Venezuela have entered into a holy alliance to exorcise these colectivos: political parties, NGOs, the foreign press, and of course, Twitter users. One cannot but feel privileged and awed to meet three of Burma's “88 Generation” student uprising leaders: Min Ko Naing who has spent most of the years since 1988 uprising jailed by the Burmese military dictatorship for his opposition activities; Ko Jimmy, who spent 20 years as a political prisoner and who was recently thrown back into what he wryly describes as “our second home” for protesting against fuel price hikes; and Ko Ko Gyi who spent 17 years in prison for opposing the military regime. An Egyptian court sentenced three Al Jazeera journalists to seven years in prison on terrorism-related charges on June 23. Baher Mohammed, the team’s producer, received an extra three years for possession of ammunition, a charge concerning a souvenir spent shell found in his possession, Morning Star said that day. The verdicts against Australian Peter Greste, Canadian-Egyptian Mohammed Fahmy and Egyptian Baher Mohammed came after a five-month trial that Amnesty International described as a “sham”, calling the rulings “a dark day for media freedom in Egypt”. Venezuelan President Nicolas Maduro issued a call on June 7 to each grassroots unit of the governing United Socialist Party of Venezuela (PSUV) to submit 10 proposals for ways to improve how the government functions, Venezuelanalysis.com said on June 21. “The rising sea levels caused by global warming threaten the very existence of some of our neighbours,” Fijian Prime Minister Frank Bainimarama told the Pacific Island Development Forum (PIDF). Three Muslims were killed and about 10,000 made homeless after attacks by Sinhalese Buddhist mobs during the week starting June 15. Violence began in the town of Aluthgama after a rally by the Sinhalese-Buddhist chauvinist group Buddhist Power Force (BBS). It then spread to several other towns. Muslim-owned shops, houses and vehicles were burnt by the mobs. Police were sometimes present, but did nothing to stop the violence. The BBS has been engaging in a campaign of anti-Muslim propaganda and violent attacks for several years. The Summit of the Group of 77 plus China, marking the alliance’s 50th anniversary, closed in Santa Cruz, Bolivia, on June 15 with the adoption of a declaration entitled “For a New World Order for Living Well”. There were delegates from 104 nations out of the 133 from the global South that now make up the Group of 77 plus China. Bolivia is chairing the alliance this year, and its president, Evo Morales, hosted the summit. United Nations experts warned the city of Detroit on June 26 that service cut-offs could constitute a violation of the human right to water. Several groups concerned about Detroit residents who had their water shut off for nonpayment had taken the unusual step of appealing to the UN for support in an effort to force the restoration of services. Dozens of Palestinians held without charge or trial by Israel ended their 63-day hunger strike protest on June 25. It was the longest hunger strike in the history of the Palestinian prisoners movement. Palestinian and Israeli human rights groups said on June 26 that about 80 of the hunger strikers were still hospitalised and shackled to their beds. Meanwhile, the Israeli government is set to push through laws to permit the force-feeding of hunger strikers. Israeli Prime Minister Benjamin Netanyahu weilded this threat in a bid to break the two-month strike. “When Gerry Conlon, who has died aged 60 of lung cancer, met survivors of the US's Guantánamo Bay detention camp, he found that their 21st-century experiences mirrored his in the 1970s,” The Guardian wrote about the Belfast-born Conlon who passed away on June 21. He spent more than 14 years in jail from 1974-1989 after being found guilty by British authorities for pub bombings in Guilford that he did not commit. A glaring omission from the strategy debate over how to fight the budget has been any solid discussion from most union leaders about how and when to deploy industrial action. At the packed out mass delegates' meeting in Sydney on June 12, National Tertiary Education Union activist Susan Price moved two amendments to the official motion that, judging from the room, had they been put would have committed Unions NSW to do just that. The government is ducking and weaving in the face of combined resistance to its cruel budget. Employment Minister Eric Abetz admitted to a Senate Estimates hearing on June 26 that the Productivity Commission's review of the Fair Work Act will now be delayed until the second half of this year. The media say this is to allow the government to devote its energies into getting its budget measures through, and to avoid an all-out campaign by unions to "revive the spectre of Work Choices". Is it just me, or are the government going out of their way to be such extreme bastards on such a wide array of issues, that it seems a plot to just wear us all out? Because once you've screamed “AAAAAAAAARRGGHH” for the 17th time in the first half hour after waking up, you've got no voice left with which to register a protest about the 18th insane injustice — inevitably some proposal to force disabled pensioners to sell at least two still-functioning organs or face being put to work as indentured servants for Gina Rinehart. At its national conference over June 7-9, the Socialist Alliance adopted an amendment to its Charter of Aboriginal and Torres Strait Islander Rights, which stated that it does not support Constitutional recognition in the current form put forward by the government and the Reconciliation Australia initiative Recognise. The policy now states that Constitutional recognition must be accompanied by sovereignty, land rights and a treaty. Breakthrough 2014, National Climate Restoration Forum, held over June 21 to 22 in Melbourne, brought together scientists, economists, engineers, business leaders and climate activists. In some regards, the forum represented an important step forward for the Australian climate movement. It highlighted the urgent need to respond to the climate crisis and discussed the possibility of restoring a reasonably safe climate in which human civilisation could continue. LIFE FOR MOST AUSTRALIANS IS GETTING HARDER, WHILE POLITICIANS SERVE THE WEALTHY. BUT PUBLIC BACKLASH IS BREWING INTO A MOVEMENT TO CHALLENGE THIS SYSTEM, WRITES SUSAN PRICE. In handing down its first budget, the Coalition government echoed its National Commission of Audit, warning that a “business as usual” scenario for public spending on welfare, pensions, public services, health and education is “unsustainable”, even “irresponsible” in Australia today. In the first two weeks of hearings at the Royal Commission into Trade Union Governance and Corruption, further claims were made against Labor leader and former national secretary of the Australian Workers Union (AWU) Bill Shorten. Former Health Services Union (HSU) official Marco Belano told the commission that Shorten donated $5000 to his 2009 union election campaign when Shorten was parliamentary secretary for disabilities in the Labor government. In 2011, the Maritime Union of Australia invited leaders of the Miscarriages Of Justice Organisation (MOJO) in Britain to Australia -- Gerry Conlon, Paddy Joe Hill and John McManus. When Gerry Conlon died on June 21, it reminded the world once more of the cases of the Guilford Four and the Birmingham Six, Irish people framed for bombings in England they had noting to do with. Conlon, of the Guilford Four, jailed in 1974, endured more than 14 years in prison, including solitary confinement, before finally clearing his name. A 13-year-old boy from Brazil’s Guarani tribe makes a political stand in front of 70,000 football fans and what he thinks is an international audience. A movement led by indigenous women in the United States beats a billion-dollar brand of the big, bad NFL. These two stories share more than the fact that they took place during the same week. They share the ways that people in power have sought to combat their courage by trying to render them invisible. On April 25, 1915, Australian troops landed at Gallipoli on Turkey’s coast. They were part of a British imperial force aiming to capture Constantinople (now called Istanbul) and the land alongside the narrow waterway linking the Mediterranean to the Black Sea. It was hoped this would enable British ships to enter the Black Sea and bring supplies to allied Russia.